SMU’s conference title hopes died Friday night; victims of sloppy play, missed opportunities and gambles gone wrong. In front of a paltry crowd at Ford Stadium, SMU lost 28-18 to the Memphis Tigers, eliminating the Mustangs from the AAC title hunt. From the first drive onward, SMU played aggressively, gambling like they had all season. Facing fourth and one at their own 34, the Mustangs went for it and converted, as Ke’Mon Freeman ran two yards to move the chains. On SMU’s next drive, things didn’t go so smoothly. 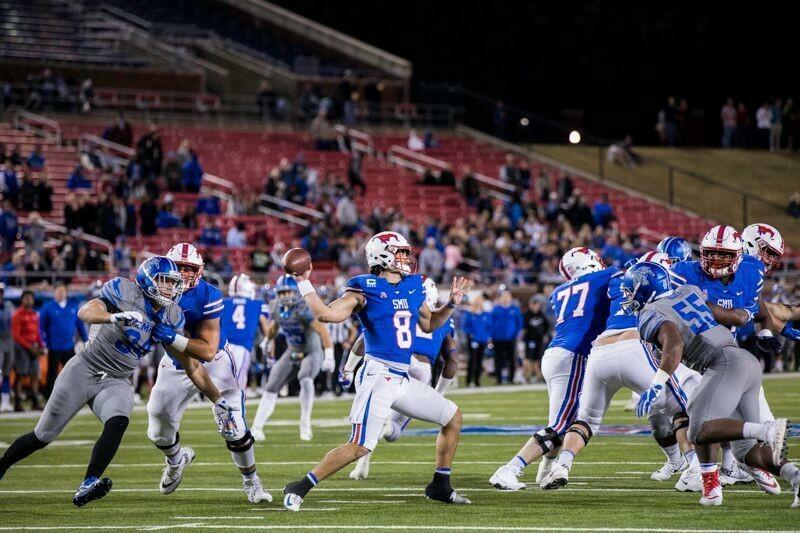 Sonny Dykes opted to run the ball on fourth and one, instead of kicking the field goal that would put SMU up 3-0, and Freeman was stuffed behind the line, costing SMU a chance at points. But Memphis was equally as sloppy, at least early in the game. After a field goal, the Mustangs attempted a short kickoff that resembled more of a long onside, Memphis mounted a 12-play, 55-yard drive that ended with a missed 21-yard field goal. The Tigers scored the first touchdown of the game after the Mustangs failed to pick up a first down on a fake punt inside of their own 25-yard line. The play itself was bizarre. On a fourth and six, punter Jamie Sackville shoveled the ball to up back Ben Redding, who was tackled short of the first down and tried to heave a desperation lateral back to Sackville. The ball didn’t find the Australian punter, and a Memphis player jumped on it. Two plays later, the Tigers held a 7-3 lead thanks to a 16-yard touchdown pass which saw Memphis quarterback Brady White scramble out of a sure sack and find his tight end in the corner of the end zone. All game long, SMU struggled in the red zone. The Mustangs were just two of four in the red zone and left points on the board. Nine of its drives went into Memphis territory. Perhaps the most notable example came right before the half, when Ryan Becker caught a pass inside the Tigers’ six-yard line and was smacked by a defender, fumbling the ball in the process. The Mustangs could have made it a 10-7 game, but a safety on Memphis’ ensuing possession set the score at 7-5 going into the half. Down 14-5 midway through the third quarter, SMU turned the ball over again, as Hicks was intercepted at the Memphis 24-yard line. After the game, coaches clarified that there was some miscommunication on the play. Still, a promising drive ended without points for the third time. Memphis came into the game averaging more than 44 points per game, but was held to just seven in the first half. The unit was able to bottle up Darrell Henderson, the Tigers’ running back who came into the game averaging 9.2 yards per carry. He had just 75 yards on 16 carries. Brady White struggled too, throwing two interceptions. He had just three on the season coming into the game. Still, Memphis’ rushing attack wore down the SMU defense as the game went on. Time and time again, the Mustangs forced Memphis into third-down situations, but just couldn’t get off of the field. In the second half, Memphis converted on six of its eight third downs. This led to three touchdowns on the team’s first five possessions after halftime, which was the impetus for a 21-7 run that put the Tigers up 28-12 with just less than nine minutes to go in the game. SMU mounted one last drive, scoring to pull within ten on fourth and goal from the two-yard line with 6:15 left to play. Hoping to make it a one-possession game, the Mustangs failed to convert. They’d get one last opportunity, but holding penalties and a sack sank it. Memphis was able to run out the clock and put an end to SMU’s conference championship hopes. The Mustangs drop to 5-6 (4-3) with the loss. They’ll need to beat Tulsa next Saturday to become bowl eligible. It’s a do-or-die game. Win and the season goes on. Lose and it’s over.